Our very own Chris Sheard will be reprising his role in the latest show for Acorn Productions – Thick as Thieves. Chris will be appearing alongside his co-star Cev Barker on the 24th & 25th March 2017, at The Academy Theatre in Barnsley. 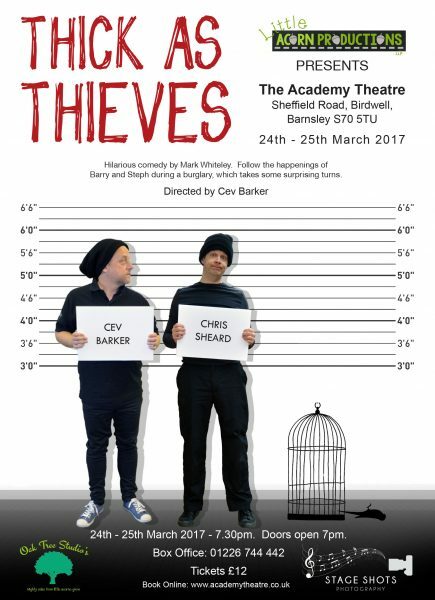 Thick As Thieves shines an amusing light on the ups and downs of breaking and entering, as hapless criminals Steph (Cev Barker) and Barry (Chris Sheard) go on the rob. The fast-paced, at times raw two-hander sees the pair worry about more than just getting caught as events unfold. But the laughs are plentiful as the duo explore their target home — and learn some eye-opening things about the occupant. The play was actually written by a reformed burglar. Below is the link to the Facebook page as well as a link to tickets. The venue is just off Junction 36 M1, Tankersley Manor Junction.